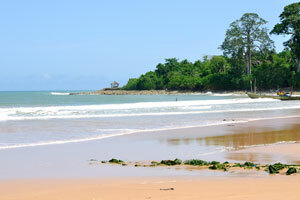 The eastern side of the Busua beach. 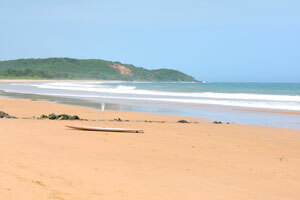 The western side of the Busua beach. 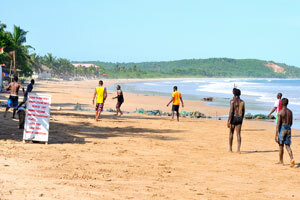 Busua beach is not only the comfortable place for vacationers but the most exotic place in Ghana. 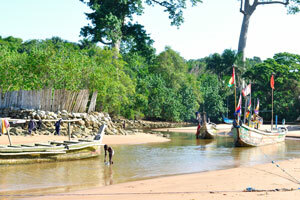 Busua is a fishing village. 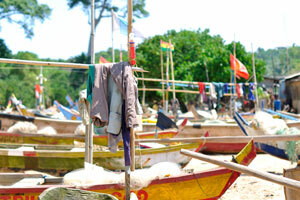 Busua fishing village is known for blue marlin and tuna fishery. 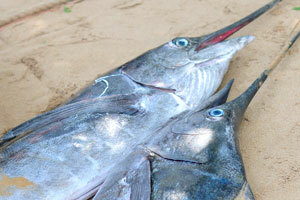 The village is located in the migratory path for not only large numbers of big blue marlin, but a migration of bluefin tuna - a budding and prolific recreational fishery in Ghana. 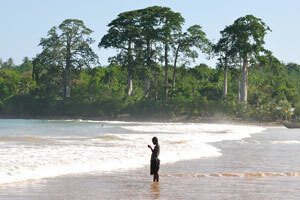 So if you're looking for your next fishing adventure in Western Africa, with opportunities to catch both large marlin and giant tuna, you should add Busua fishing village to the top of your list. 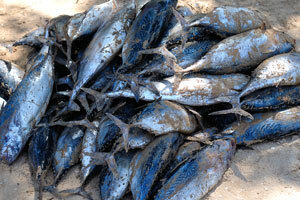 Freshly caught tuna piled on the sand of the beach. 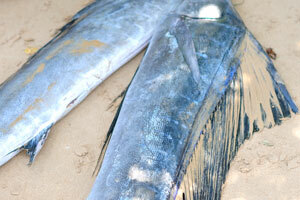 A marlin is a fish from the family Istiophoridae, which includes about 10 species. 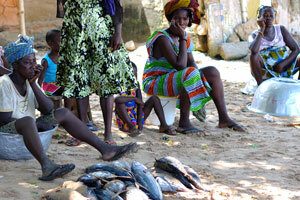 Locals are gathered around the piles of tuna. 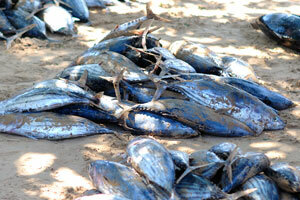 Perhaps, tuna is the main fish of the local fishery. 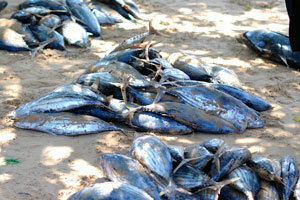 There are huge stocks of tuna fish in the ocean. 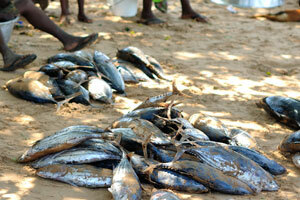 The tuna fish will be sold out to the locals soon. 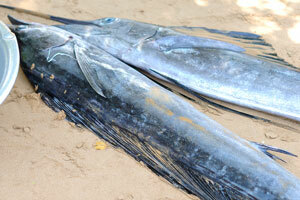 The Atlantic blue marlin “Makaira nigricans” is a species of marlin endemic to the Atlantic Ocean. 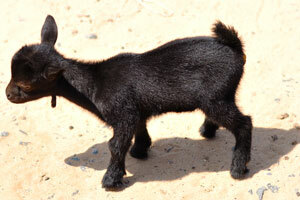 A tiny black goat kid. 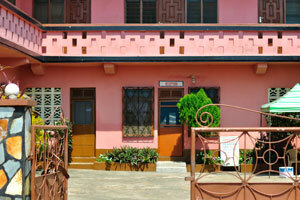 An ordinary rural house where a family lives. 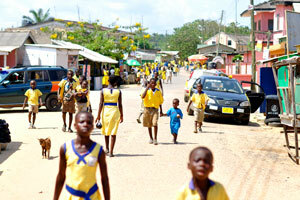 Children are walking home after school. 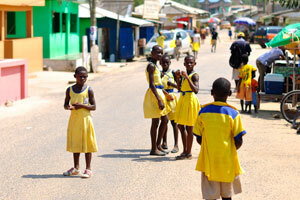 Schoolgirls are dressed in long yellow dresses. 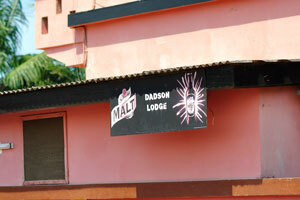 The reception of Dadson's Lodge. 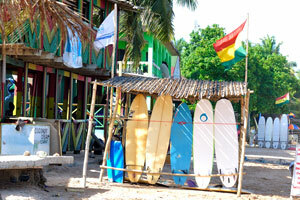 Ahanta Waves Surf School & Camp. 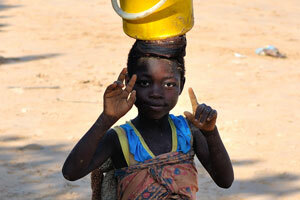 A schoolgirl struck a pose showing a candy in hand. 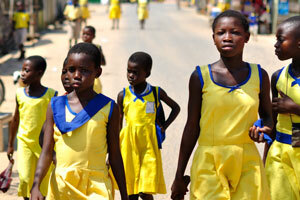 Schoolgirls have not yet decided whether to strike a pose. 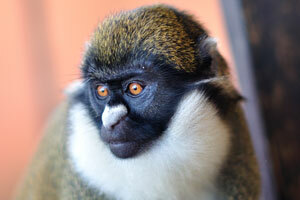 My candy bait aimed for portraits works perfectly, the temptation to get more candies is huge. 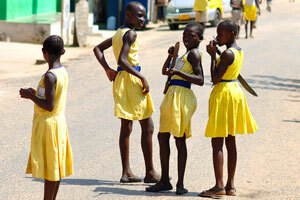 Schoolgirls are arguing about the received candies. 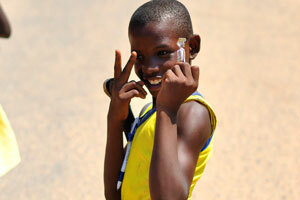 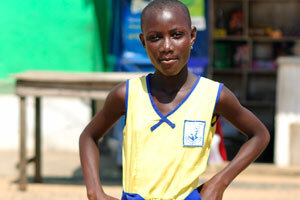 A Ghanaian schoolgirl struck a pose. 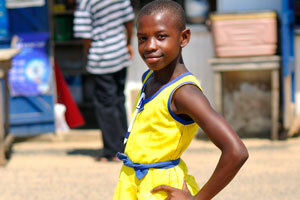 A cute schoolgirl struck a pose. 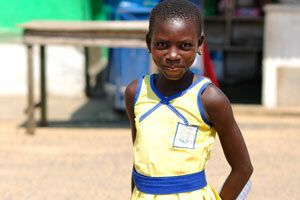 A lovely Ghanaian schoolgirl struck a pose. 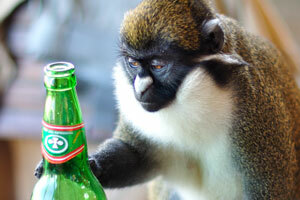 This monkey likes to drink a beer. 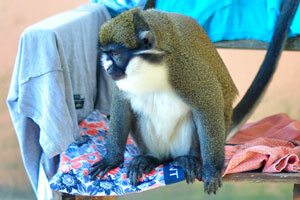 The monkey came here to drink beer. 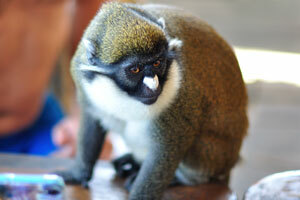 I was under tension suspecting that this monkey is a skilled thief. 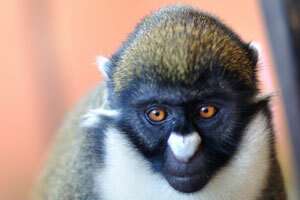 The drunken monkey with worried eyes tries to find more beer. 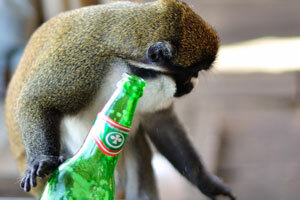 What do you think whether this monkey a thief or an alcoholic? 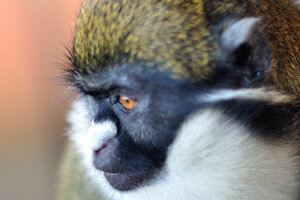 The black faced monkey has the white nose. 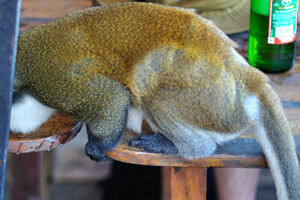 This monkey was a true entertainment for us at the time of lunch. 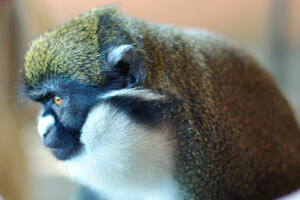 A monkey stretches its paw and wants to receive something valuable. 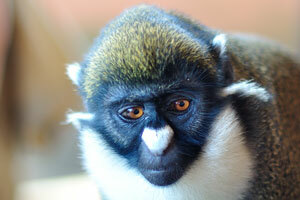 This monkey wants to be the friend, isn't it? 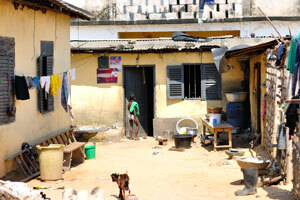 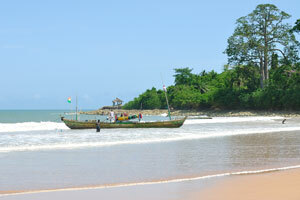 Busua is about 30 kilometers west of the regional capital, Sekondi-Takoradi in the Gulf of Guinea. 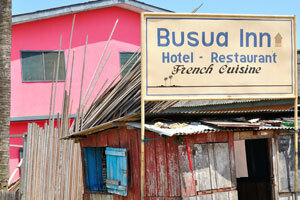 Busua is classified in the category of towns with more than 5000 inhabitants. 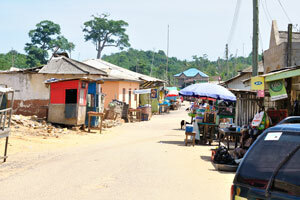 Busua has a paved road from Sekondi-Takoradi to reach the town. 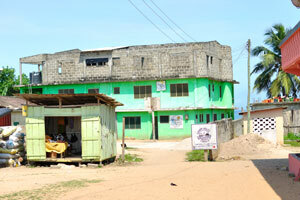 The inhabitants of Busua town speak the Akan language dialect Ahanta. 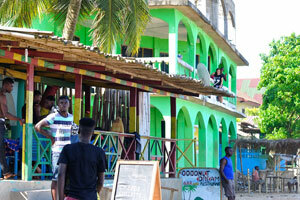 Busua was famous as a seaside resort for wealthy locals from Sekondi-Takoradi until the 60s of 20th century. 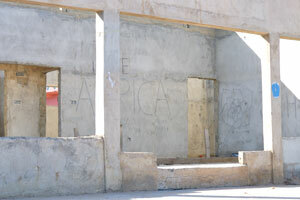 Wikipedia says, there is a prostitution center in the town. 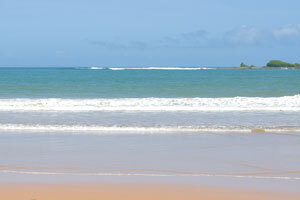 In recent years the town has obtained full electricity connection, restaurants and a shopping center. 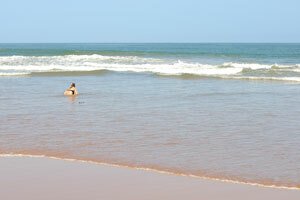 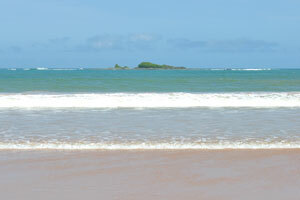 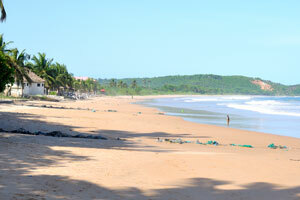 Busua beach is a long sandy beach that is free of dangerous currents. 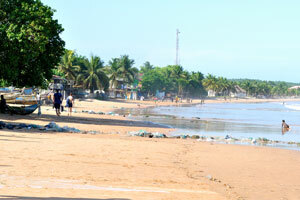 Busua beach is clean and it is great to walk along the shore. 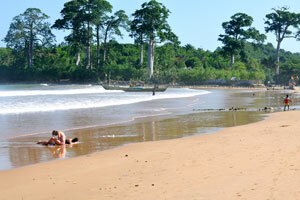 Busua beach is amazing and calming. 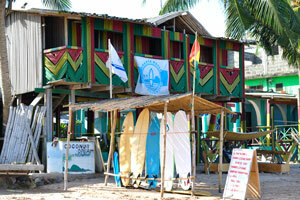 Coconut Dream bar and restaurant. 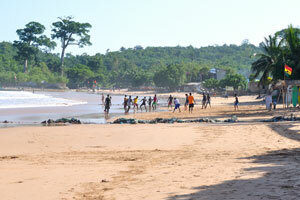 Busua beach is the most famous and comfortable place where one can spend a beach holidays in Ghana. 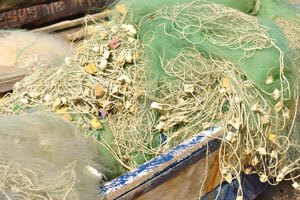 Fishing nets of green color. 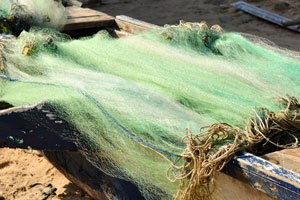 Fishing nets are in the boat. 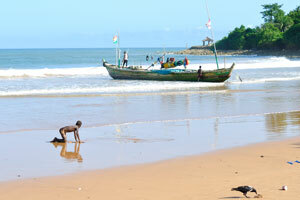 A boy and a crow are on the Busua beach. 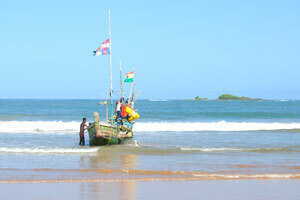 A fishing boat is arrived. 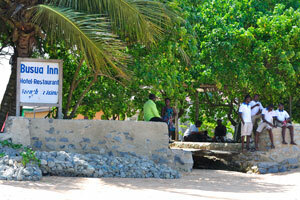 The fishing village of Dixcove can be reached from Busua in about 25 minutes on foot. 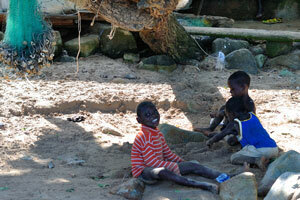 Three boys play in the shade of a tree. 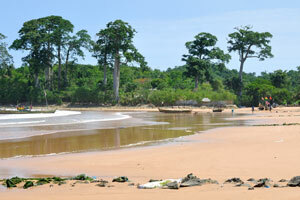 The beauty of Busua lies in its long sandy beach and its proximity to Butre and Dixcove. 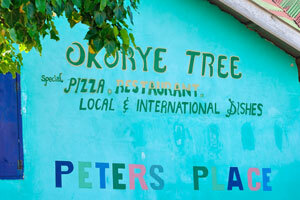 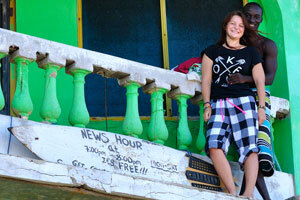 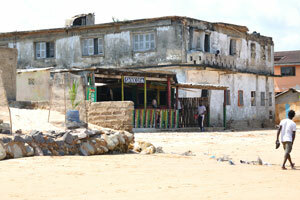 Busua is a quaint town, it has a different feel from the other towns of Ghana West Coast. 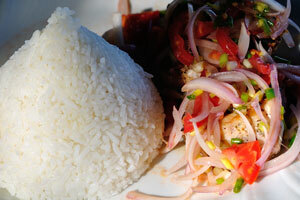 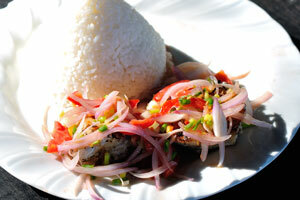 Grilled fish is served with rice, tomatoes and onion. 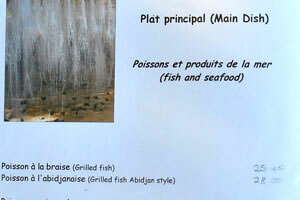 Grilled fish with a pleasant taste was cooked for me. 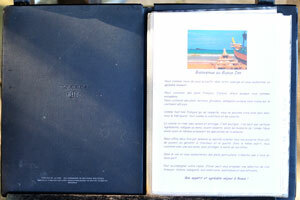 Prawns in olive oil with garlic. 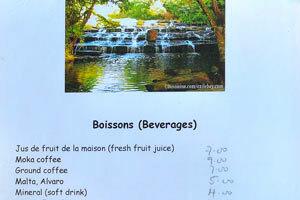 Beverages, white and red wines. 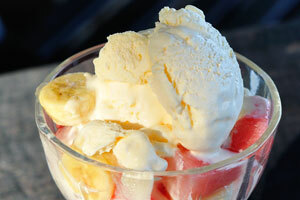 I ordered the dessert of “Fresh fruit salad and ice cream”. 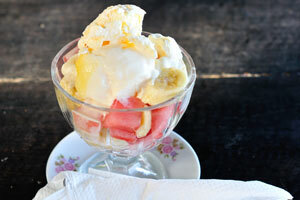 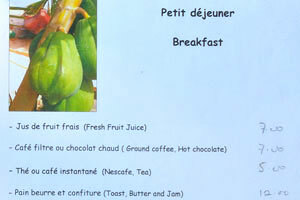 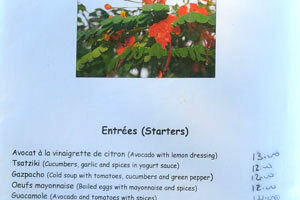 The dessert of “Fresh fruit salad and ice cream” costs 16 Ghanaian cedis or 4 US dollars. 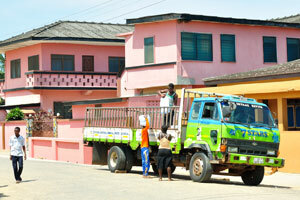 The truck is parked on the main street of fishing village. 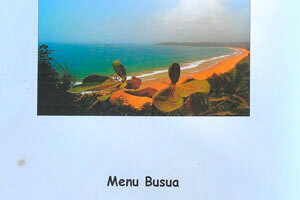 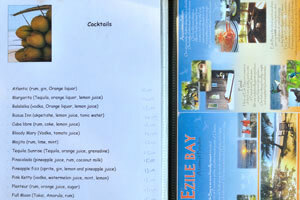 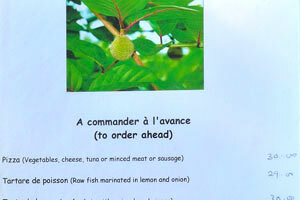 A pointer reads “Busua Inn, Hotel - Restaurant, French Cuisine”. 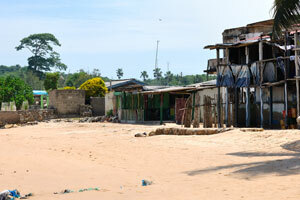 The main street of the Busua fishing village. 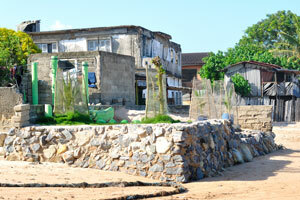 Busua Inn as seen from the beach. 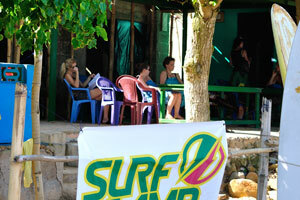 The Black Star surf school. 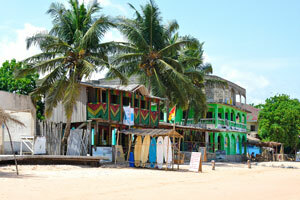 Busua is a beach resort and fishing village in the Ahanta West District.